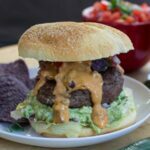 This Nacho Burger is loaded with all your favorite nacho toppings- guacamole, pico de gallo, spicy queso, and even crushed tortilla chips. If you really want to spice it up, throw a few pickled jalapenos on top. The spicier the better! Sometimes just a plain juicy burger on a nice soft bun will suffice. But most of the time I like my burgers loaded with toppings. I’m talking loaded to the point I can’t even get the burger in my mouth and I have to knife and fork it. Even though I’m happy with a burger solely dressed with guacamole, there’s no reason to stop there when you can really amp up the flavor. Add on an easy queso made from velveeta (or cheese in a box as we call it) and a can of chili. Some fresh pico de gallo adds a wonderful freshness and a few crushed blue tortilla chips provide a little crunch and round out the nacho theme. Really, the actual burger is just a vehicle for getting the toppings in your mouth. This is a messy burger so be sure to pass out a lot of napkins. There are a lot of components to this, but all of them can be made ahead of time, taking the pressure off of you if you have guests over for a little backyard party. You’ll have plenty of extra queso to serve with chips. 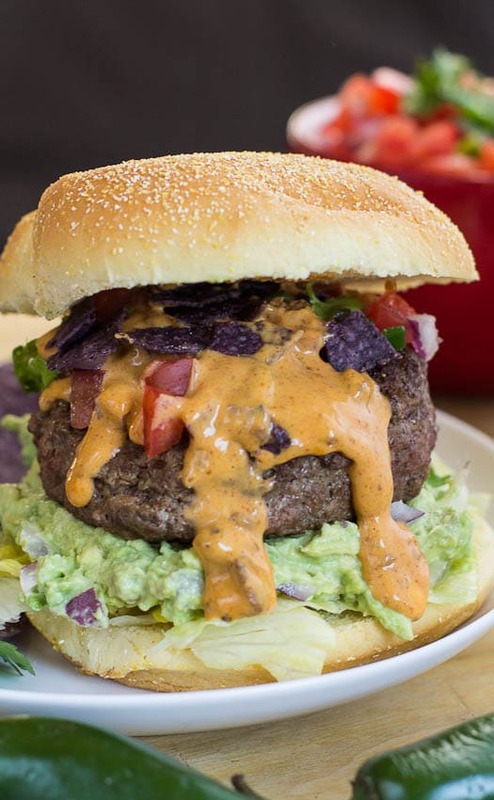 A Nacho Burger with guacamole, nacho cheese sauce, pico de gallo, and crushed blue corn chips will leave everyone oohing and aahing. And of course don’t forget to have plenty of cold cervezas on hand to wash it all down with. 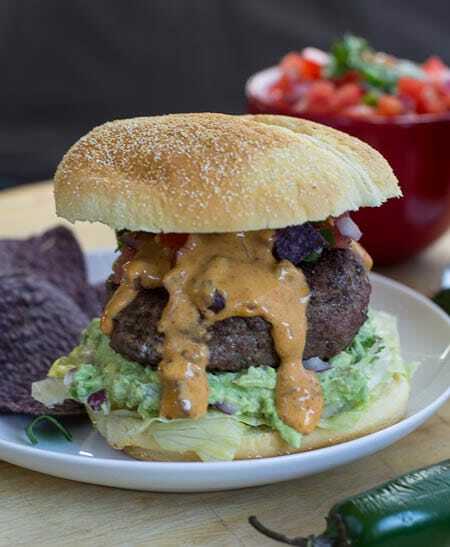 A juicy burger loaded with all your favorite nacho toppings- guacamole, pico de gallo, and a spicy queso. Make the guacamole. Place the avocado in a small bowl and mash well with a fork. Add remaining ingredients and stir well to combine. Cover with plastic wrap and refrigerate until needed. Make pico de gallo. Combine all ingredients in a small bowl and toss to combine. Cover with plastic wrap and refrigerate until needed. Make Queso sauce. Cut velveeta cheese into small chunks (so it will melt faster) and place in a medium saucepan with the other queso ingredients. Heat over medium heat, stirring constantly until cheese melts. Reduce heat and let mixture simmer 15 minutes. Heat a gas grill or grill pan over medium heat. Season the ground chuck with salt, pepper, and 1/4 teaspoon garlic powder. Shape into 4 patties. Cook for approximately 5 minutes per side or until desired degree of doneness. To assemble, place lettuce on bottom bun half, topped by guacamole and a burger patty. Ladle with queso. Add pico de gallo, pickled jalapenos (if desired) and crushed tortilla chips and top with other half of bun. This entry was posted in Main Dishes and tagged beef, burgers, guacamole, Mexican, nachos. Bookmark the permalink. Wow, this is one serious loaded burger – I love how high you piled everything! It looks incredible and so mouthwatering! Now this is a serious burger, Christin! My husband would love this and now that the spring weather is back, I will have to try this recipe the next time we grill burgers. Oh gosh I LOVE pico de gallo and that alone would make me eat this burger! Of course, it has a ton of factors going for itself, being that it looks absolutely delicious and is mouthwatering! I love the photos for this burger Christin, you knocked it out of the park! I love putting avocado on my burgers. These look so good! Gah, oh my gosh this burger! So many good things in one! 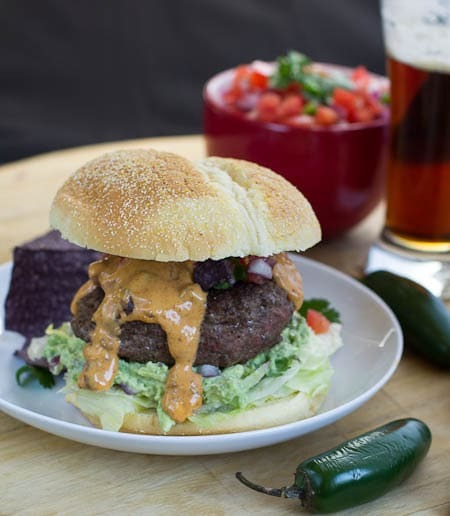 I love a good, loaded burger … and with the mexican flavors … so right up my alley! This looks awesome Christin! No wonder I’m so hungry – how can you not love a burger like this? Yum! Your burger will definitely take more than one napkin but I know it is delicious. OMG, this is my kind of burger! 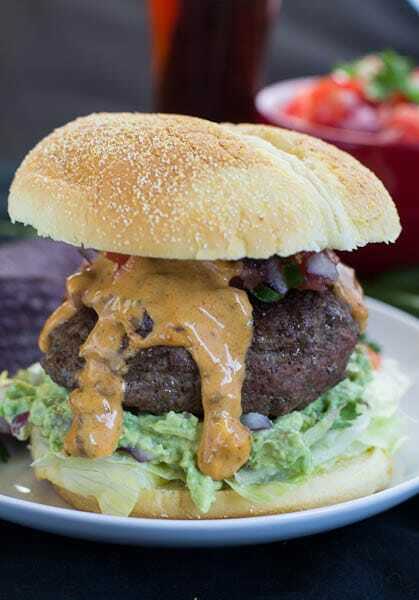 Nacho toppings on a burger is such a genius idea, can’t wait to try this ASAP! 🙂 YUMM!